La traque dans des années 50, dans la campagne sud-africaine de John Kepe. Cet homme qui s'est auto-proclamé le "Samson du Boschberg" (sorte de "Robin des bois") est indéniablement devenu une menace contre les règles de la société coloniale. Film inspiré de faits réels. * World Premiere of Jahmil X.T. 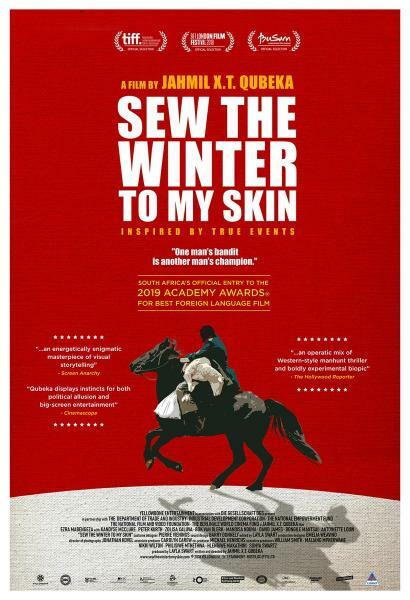 Qubeka's SEW THE WINTER TO MY SKIN at the upcoming Toronto International Film Festival. A rousing, action-adventure-epic set in early 1950's rural South Africa, chronicling the captivating chase and suspenseful capture of the native outlaw, John Kepe. This self-proclaimed "Samson of the Boschberg" inevitably became a political threat to the very fabric of the ruling colonial society. In a racially-charged and violent 1950's rural South Africa, a liberal journalist recounts the epic chase, edge-of-your-seat capture and intriguing trial of a flamboyant, native "Robin Hood". His captivating re-imagining, paints a portrait of a divisive outlaw - hunted by the Republic, elusive even to his loved ones, all whilst remaining a champion of the disenchanted. starring Ezra Mabengeza, Kandyse McClure, Peter Kurth, David James, Antoinette Louw. SEW THE WINTER TO MY SKIN | OFFICIAL TRAILER (2018) from Yellowbone Entertainment on Vimeo.